Mother's Day is just around the corner and I love that we can not only celebrate our Mother's but all the special Women in our lives. 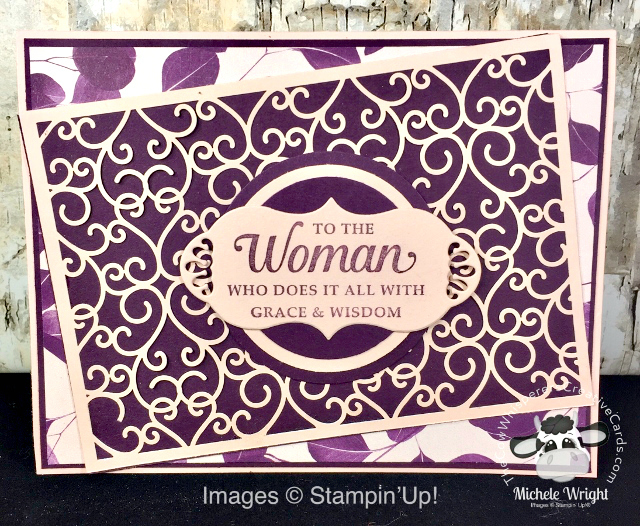 I absolutely love all the sentiments in the Strong & Beautiful Stamp Set. 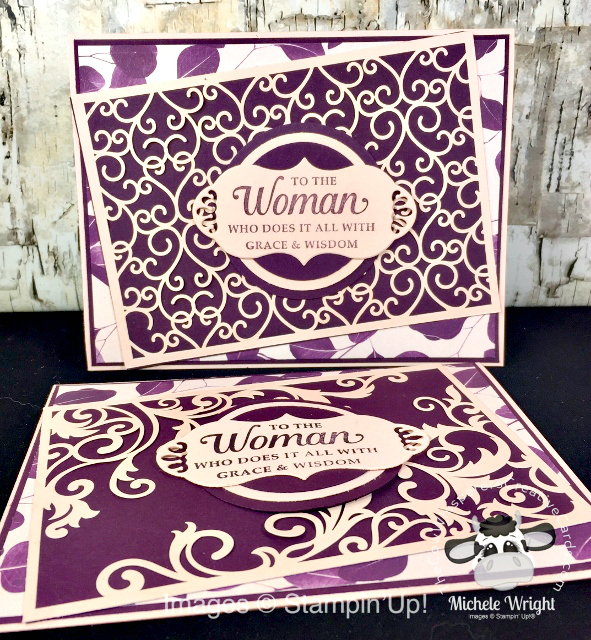 This stamp set was designed to allow us to mix and match the sentiments for any type of occasion. Many of these sentiments can actually be used on masculine and kids creations as well. I chose 2 different pieces of the Beautifully Detailed Laser Cut Specialty Paper for this card and because it's Whisper White on one side and Petal Pink on the other, I felt it paired perfectly with the Nature's Poem Designer Series Paper. I stamped the sentiment on Petal Pink Cardstock and then cut it out with the Hummingbird framelits label die. I highly recommend the Silicone Craft Sheet when adding the multipurpose liquid adhesive to the laser cut paper and you'll see why in the video below. I hope today's creations get you thinking about the special women in your life and that you'll create something beautiful for them as well. Card Base - Petal Pink - 8 1/2" x 5 1/2" scored at 4 1/4"
First Layer - Blackberry Bliss - 5 3/8" x 4 1/8"
Second Layer - Nature's Poem Designer Series Paper - 5 1/4" x 4"
Third Layer -Beautifully Detailed Laser Cut Specialty Paper & Blackberry Bliss - 5" x 3 1/2"
My April Customer Appreciation PDF was created by my teammate Stephanie Bobenmoyer. 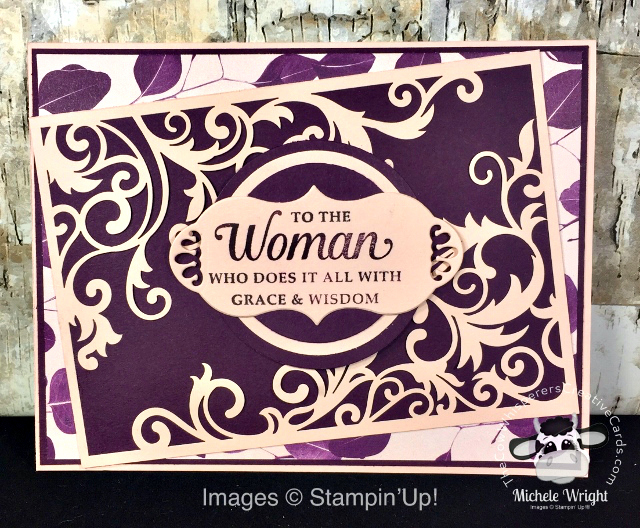 The Hand Delivered and Picture Perfect Birthday Stamps sets were her focal points on these creations. This PDF includes all the instructions to create 6 fancy fold cards. All orders of $40.00 or more BEFORE tax and shipping placed on my online store with the Hostess Code HGJWMPY2 will be qualified to receive the above PDF. Please remember, you MUST enter the HOSTESS CODE above to receive the PDF :) If your order is over $150 DO NOT enter the hostess code and you will get all the stamping rewards and I will send you the PDF as well. All qualified orders will receive the PDF email from me within 48 hours from the time the qualified order is placed.